The Interpretation of the Meaning of The Noble Quran By Muhammad Muhsin Khan and Dr. Muhammad Taqi-ud-din Al-Hilali is a summarized version of At-Tabari, Al-Qurtubi, and Ibn Kathir with comments from Sahih Al-Bakhari. 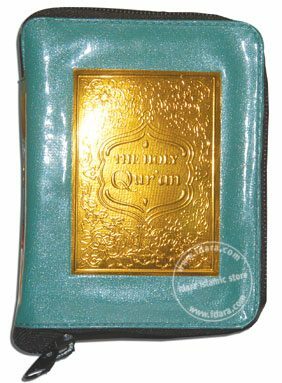 This Qur’an is a small pocket sized Quran 12 x 9 cm with Zipper Purse presented in Arabic along with the English translation. This Quran features a glossary of arabic terms in the back, along with an explanation of some of the most common beliefs of a Muslim.